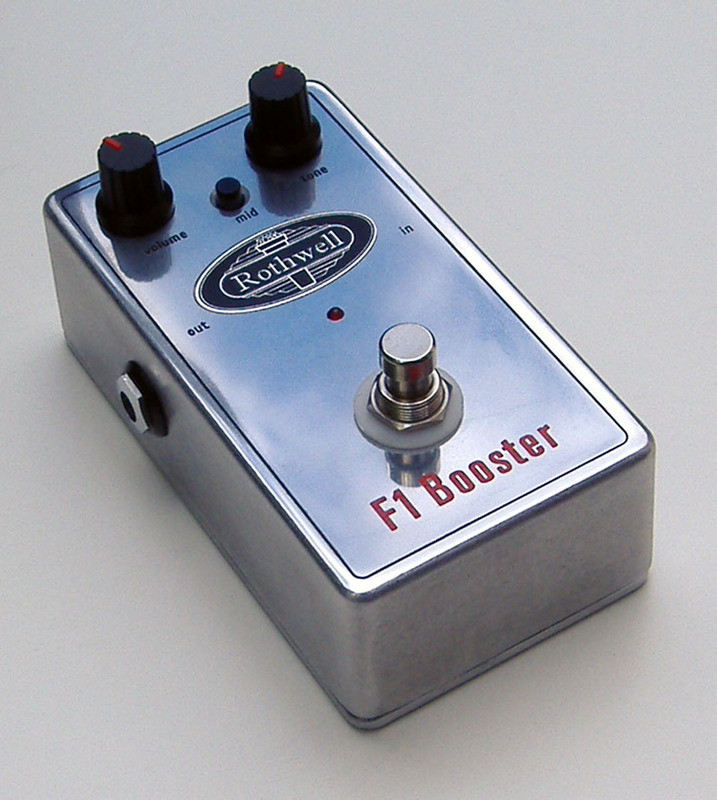 The F1 Booster is a clean boost pedal which has greater flexibility than simple boosters or treble boosters. Built to the same high standards as all Rothwell pedals - with top quality components, meticulous circuit design and hand polished and engraved cases - this pedal allows you to fine tune the sound with a tone control and a mid contour switch. The mid contour gives a scooped mid range when set to the down position (10dB cut at 550Hz) and a very gentle boost (4dB at 700Hz) when set to the up position. In both cases the eq is based on simple passive circuitry very similar to that found in vintage amps. This makes the effect very natural sounding without any type of strange nasal tonality. The rotary tone control boosts treble and cuts bass when turned clockwise, and cuts treble and boosts bass when turned anti-clockwise. The combination of the mid switch and tone control allow you to fine tune your sound so that the boosted tone works just as well as the un-boosted tone. Bass, for example, can be set so that boosting the signal doesn't cause the bottom end to become uncontrollable. The mid range can be boosted to give a fat lead sound or cut for a modern high-gain rhythm sound. The F1 Booster can even be used in the opposite manner to what would be expected - ie activate the pedal to drop the signal level. This might be useful if you like to set your amp's lead channel for your ideal lead sound and then use the F1 booster to cut back the level for a rhythm sound, maybe using the mid cut function to optimise the tone for rhythm. There's enough flexibility to use it however you want to. The pedal has true bypass switching so it's completely isolated when bypassed, and can be powered from an internal 9 volt battery or and external DC power supply in the range 9-18 volts. The F1 Booster costs £119 and is available from our UK and international dealers (full list) or from the online shop.